The twenty-five-million bestselling Japanese heroic fantasy goes manga! 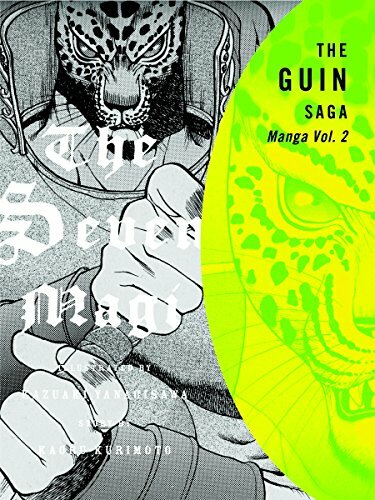 Never has a story been more suited to the form than the pulse-pounding saga of the leopard-masked warrior, who cannot remember his past.In this first manga series, King Guin must battle a plague made manifest and controlled by seven magi. But even if our hero vanquishes the Black Plague, how will he ever hope to defeat seven powerful magicians?Hold onto your seats! Comic artist Kazuaki Yanagisawa is renowned for his fine pen touch and excellence at adapting sophisticated source material. Other works by Yanagisawa include Paparazzi (story by Lone Wolf and Cub's Kazuo Koike), a Megami Tensei comic based on the hit videogame cycle, and The Summer of Ocelot, adapted from the novel by former Golgo 13 storywriter Yoichi Funado. The Guin Saga is the lifework of multi-talented Kaoru Kurimoto, who has written musicals based on her creation in addition to the bestselling novels. The Seven Magi first appeared in novel form in 1979 to great acclaim. The five-book opening episode of the saga proper is also being published by Vertical.